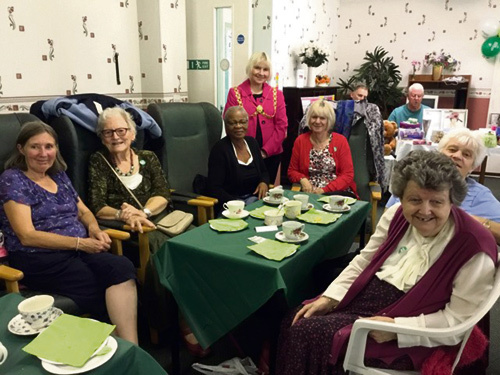 BRISTOL Lord Mayor Lesley Alexander was guest of honour at a recent charity coffee afternoon at Begbrook Retirement Club. The event, in aid of Macmillan, saw neighbours, friends and members of the retirement club turn up in force to lend their support. Local PCSO for Fishponds, Nwanna Egwuonwu, was also in attendance. A spokesman for the club, which was founded by Councillor Alexander, said the coffee afternoon raised £500. "This generosity from local people and the hard work by the club committee has helped Macmillan Cancer Support for the third year, making it part of the annual programme since the club started in 2014. "It's already been pencilled in for September 2018 and the committee even has their own green T-shirts especially for this lovely afternoon." Products were donated from M&S Eastgate, Morrisons Fishponds, Tesco Eastgate and Sainsbury's Filton. "Begbrook Retirement Club wishes to take this opportunity to thank everyone involved as well as for the ongoing support for all our events," the spokesman said.